At the Y, healthy living is at our core. Healthy is about more than just fitness- it’s about balance. Balance in all aspects of your life. Our programs are here to help you achieve balance and feel good. From personal training to group fitness and youth sports, we’ve got something for everyone to make small or large steps towards a healthier lifestyle. Find what you’re looking for at the Y. In this lunchtime vinyasa yoga class you will experience dynamic movements while linking breath, building heat, and endurance. This class is open to ALL LEVELS. We will explore each pose with special attention to alignment. This class will be the perfect way to start your week and stay energized. Zumba Fitness is a dance fitness class for everybody and every body! With easy to follow moves, Zumba focuses on a wide variety of Latin and International rhythms. This hour-long class is guaranteed to make you sweat! It’s not a workout, it’s a PARTY! Let the excitement begin as Mahogany takes you to the best staycation each and every Tuesday night to the Islands through movement and rhythm. This class will focus on the cultural movement of Afro-Caribbean dance. Get ready for hip winding and arms in the air as we explore our bodies’ rhythm through Caribbean and reggae music. “Move your feet to the beat” Line dance class is an hour and 45min class that teaches basic instructions, coordination, and dance combinations, all to the rhythm of different styles of music. Line Dancing also is exercise for the body & mind. Line Dancing is a fun way to dance socially without a partner. Dancing styles covered in this class include Country Western, Swing, Salsa, Tango, Cha Cha, Waltz & more. Shimmy Chic Fitness is an energetic and fun dance workout program based on the ancient art of belly dance- but with a modern twist! The class provides both calorie-burning and muscle-toning moves, along with increased flexibility, grace, and sense of self. No dance experience necessary. Shimmy Chic provides fun & repetitive routines suitable for all fitness levels. Please wear comfortable workout clothes and sneakers (you do not have to show your stomach). Open to all ages and fitness levels. Get ready for an hour of power each and every Saturday morning at 9am. This is an hour of stretching your mind and body to become one, and a reset at the end of the week. Come experience the endless possibilities as you take yourself to the next level with Mahogany. 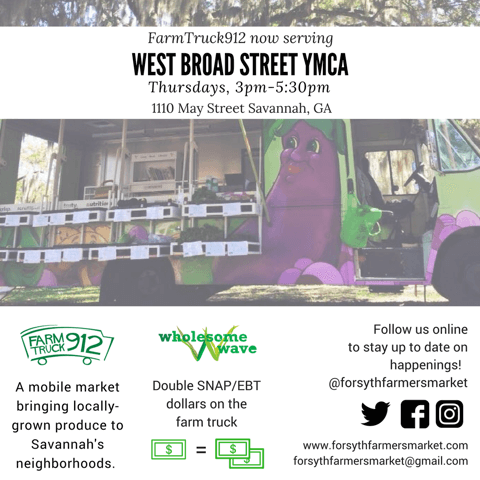 The Growing Edge Community Collaboration is a 15-agency non-profit collaborative that seeks to address areas in Savannah that lack access to healthy, affordable food. The partnership established a healthy food resource center by expanding the Beloved Community Urban Farm retrofitting and operating the Fresh Express neighborhood food truck and the creation of the Beautiful Food Project, a nutrition education program for children, families, and educators. Housed with gym equipment the YMCA fitness and recreation center provides persons with the ability to work out and focus on a healthier lifestyle.